Voting in a general election started Sunday that would most likely hand Prime Minister Shinzo Abe's right-wing ruling coalition a victory and possibly close to a two-thirds majority in parliament. Abe dissolved the lower house less than a month ago, forcing the snap election. He judged the timing was ripe for his ruling Liberal Democratic Party, or at least better than waiting until the end of its term next year. Up for grabs are 465 seats in the more powerful lower house, which chooses the prime minister. Media polls have indicated voters are passively choosing Abe's government despite its railroading of unfavorable bills and cronyism scandals, seeing it as a safer choice over an opposition with little or unknown track records. Scare over North Korea's missile and nuclear development is also seen contributing to voters' conservative choice. Media surveys also predicted Abe's coalition to win around 300 seats though they said it could lose some ground from the current 318 due to scandals. Hiroshi Yamada, 82, said his vote was based on "the issues such as (a possible) war and foreign affairs," suggesting his support for the LDP coalition amid growing concerns over North Korea. "I am supporting the political party which presents feasible policies amid the current situation." Makiko Yamada, who's unrelated to the other voter, said she was bothered by Abe's cronyism scandals. "I saw reports showing people who would help (Abe) were given high positions. It made me think twice." Voters were casting ballots early, apparently worried by an approaching powerful typhoon. Vote counting at a few locations in southwestern Japan may be delayed due to the weather, NHK public television reported. Abe says he is seeking a mandate on his government's tougher stance to defend Japan against the North's threat and his proposed increase in the consumption tax, but experts say it's an election about securing his rule. An election victory would boost Abe's chances to head LDP for another three years at the party's convention next September. 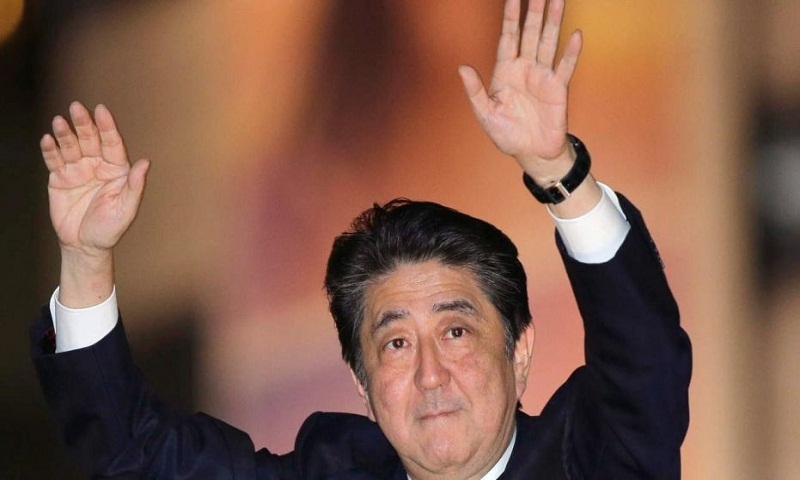 It would extend his premiership possibly to 2021 and eventually achieve his long-time goal of revising Japan's war-renouncing postwar constitution. In a speech in Tokyo wrapping up the 12-day campaigning Saturday night, Abe said, "We will protect Japan at all costs for the future of this country." Support for Abe's Cabinet has recovered thanks to the absence of parliamentary debates over political scandals during a recess. The main opposition force, the Democratic Party, was in more disarray after a leadership change and a key member was slammed by an extramarital affair. Holding off on an election would only give Abe's potential rival, Tokyo Gov. Yuriko Koike, more time to organize a challenge. Koike hastily launched a new party to contest the vote, though she ended up not running. Her Party of Hope attracted a slew of defectors from the Democrats who converted to her populist platform including phasing out nuclear energy by 2030, and freezing of a consumption tax hike due in 2019. The initial excitement for her party has waned as Koike's nationalist stance and policies were seen similar to those of Abe's LDP. The Democratic Party had imploded and its more liberal members, led by former top government spokesman Yukio Edano, launched yet another group, the Constitutional Democratic Party of Japan, whose focus on grassroots democracy, pacifist principles and calls for "decent" politics is now outpolling the Party of Hope. Abe's victory would likely mean a continuation of the policies he has pursued in the nearly five years since he took office in December 2012 — a hard line on North Korea, close ties with Washington, including defense, as well as a super-loose monetary policy and push for nuclear energy. With a possible backing from the conservative opposition, he may get the two-thirds majority he needs in parliament to propose a constitutional amendment, though any change also needs approval in a public referendum.